Every year on Remembrance Day families around the world pause to remember those who sacrificed their lives for our freedom. At Mosaic, we honour our past and present Canadian Armed Forces Members with our annual Remembrance Day Ceremony at Centre Court at the Shops on Steeles, on Saturday November 10th at 10:00 am, with current & retired Canadian Armed Forces Members in attendance. 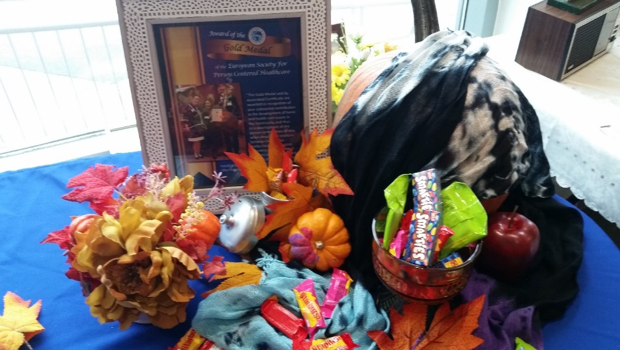 Like many Canadians, several of our Mosaic staff had grandparents & family members who served our Country and we have once again created our Table of Honour. 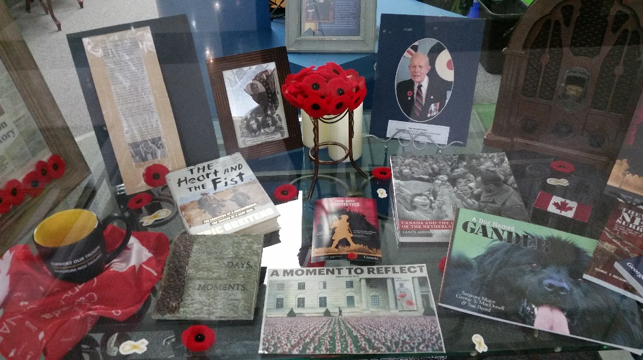 You can visit our display to view our tribute to family & friends who have served our Country as well as our information tables with historical articles & information for all ages. For 11 days of Remembrance. This is a series of special daily dedications to Remembrance by Kimberly Davies, our head of Client Services. The 11th hour of the 11th day of the 11th month. 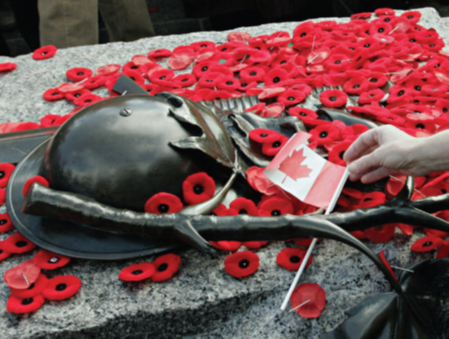 This year is the 100th anniversary of Armistice Day, known as Remembrance Day in Canada. Every year on this date, we remember. And we will continue to do so as time marches forward. But how we do this changes as the soldiers and family members of the Great World Wars pass away. Many have left memoires, photos and stories. Students learn about Wars in school from an early age through the Canada Remembers Program. Numerous university courses are available. Motion pictures and miniseries have been written and viewed by millions. Not just on these wars, but others as well that Canada has been involved. If you wear a Poppy, why? To remember past loved ones? Or to provide funds for current and future Veterans? How do you feel when you wear it? Proud? Grateful? My experience with Poppies is comical. Every year, I donate to the Legion’s Poppy campaign for the opportunity to wear a Poppy. It’s like a contest to see how long I can wear it before it disappears. One hour, one day, wow – a whole week! But it doesn’t matter. I just get another one. And another. And another. Every donation is what helps to ensure that the Legion will continue to support our Veterans and their Families. And this is how we will Remember. 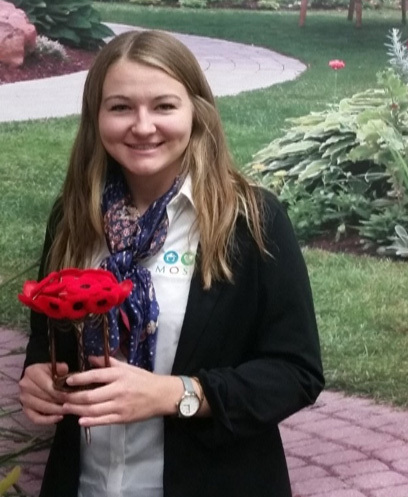 Sarah MacGilvray is our newest member of our Client Services Team! As the Client Services Department has become busier and busier with inquiries, new and more complex clients plus our Bereavement and Palliative Care Support service, the need for anadditional team member was evident. Sarah brings a social work background that will help us move forward and build for the future. Sarah’s role will continue to develop as she moves through the various roles that are key to supporting clients and front-line staff and will become instrumental in delivering the higher-level oversight for which our team as a whole is recognized for. My name is Sarah McGilvray and I am a recent Social Work graduate from Ryerson University. I am a Registered Social Worker (RSW), with the Ontario College of Social Workers and Social Service Workers. I am ecstatic to be a new member of the Client Services team in a team support role. With my experience working with older adults, people with disabilities, people with complex needs, and families, I feel well-equipped to step into this position at Mosaic. I was fortunate to minor in Family Supports and Community Practice at Ryerson and learn the importance of taking various approaches and perspectives to explore the needs of families and caregivers. Something that I believe sets Mosaic apart from other homecare agencies is the person-centered care model and Community Resource centers. 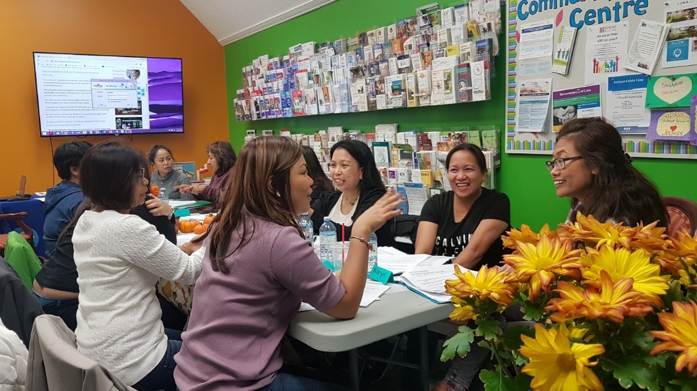 With these Resource Centers, here at Mosaic we can continue to support individuals and families through empowerment and offering resources that are accessible to the community. I was provided the opportunity to play sports growing up and I am very thankful for the ability to do so. However, recognizing that not every program and recreational activity is accessible to everyone has drawn me to the field of Social Work. Striving for change and considering the whole person when doing so, is a passion that I have. 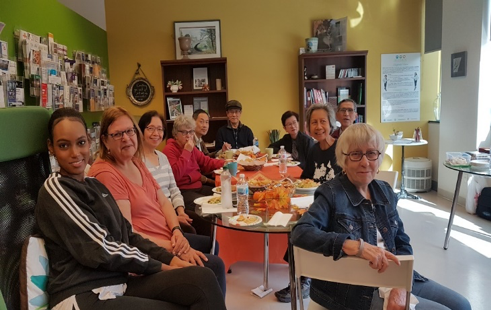 Through placement opportunities, volunteer and work experience, Mosaic Home Care’s person-centered model is a model of care that I have integrated into my everyday life when working with those in the community. After losing my grandfather to Alzheimer’s disease in 2017, I hope to use my personal experiences to support our clients and caregivers at Mosaic by being an active listener. I look forward to getting to know the people we support here at Mosaic Home Care and being a part of this amazing organization. On Saturday, October 27th, we held our second advanced training session for our person centered community integrated model of care that addresses the importance of social and emotional needs of the person. 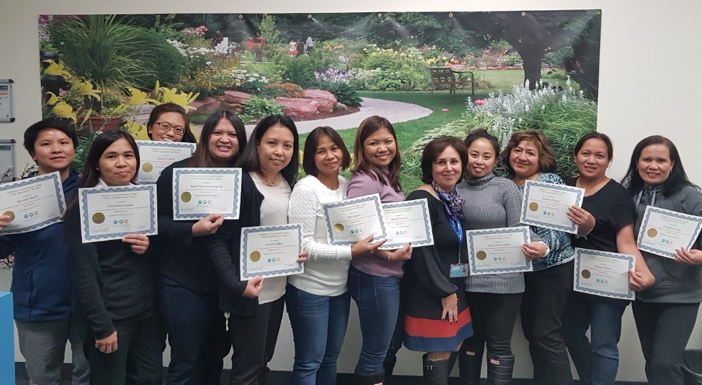 Jane Teasdale and Martha Miller provided advanced training in the “The Meaning of Me®” program for a group of caregivers who have worked with Mosaic for some time and already appreciate and understand our person centered, community integrated philosophy. It really is a rich and personally rewarding experience spending time with our front-line staff, to hear their feedback as well as to watch them interact with each other. (The above picture is Karyn our nurse who works within our client services team). Here she is with our caregivers engaging in our person centered care process and model on our training day! We should not forget that our caregivers are persons and thus have social and emotional needs that also need to be considered. 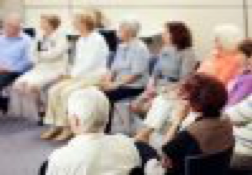 Person centered interaction requires two-way connection and our caregivers’ social and emotional needs are therefore just as important as our clients. Having this time together to share experiences and tips was a helpful reminder of this bigger picture. There is no slowing down at Mosaic. There were multiple health fairs and presentations which meant that Jane, Dina, Beth and Martha were all there to pitch in. Kimberly Davies and Martha Miller recently attended the job fair at City Hall. It’s always exciting to hear the positive responses we have received. A quick recap of Programs and Events held at Mosaic and in the Community! Dina Campeis dressed-up on October 31st in costume for a program at Thornhill Community Centre and provided refreshments for their programs. Fun was had by all who attended and this is a picture taken by Dina Campeis from Mosaic of her decorated table. This picture includes Jane Teasdale Grandson Lukas’s decorated painted pumpkin. An outing on Friday October 12th to St. Lawrence Market Tour with Bruce Bell. 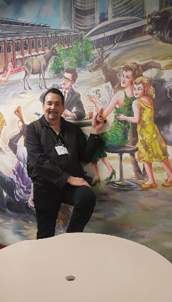 Can you spot Bruce Bell in the painting? Alas, our pole walking at the CNIB location has come to an end. We had a great season and celebrated with a final walk and potluck lunch on October 25th. Unbelievably, most brought home-cooked treats! From home-grown vegetables and to-die-for shortbread cookies, we feasted until we could not eatone more bite. Good thing we had a one-hour walk before the lunch! The lunch was so successful that we have already booked the next lunch with an international theme in December where each person attending is going to bring something from their home country. This is a perfect example of how what started as a walking program has morphed to become so much more than that. Friendships formed and grew, and we now have a lovely group of pole walkers we count as friends. Steeles Pole Walking Group continues on November 16th and will be the final pole walking session of 2018. Weather permitting, we will still walk outdoors, but otherwise will walk inside the Shops on Steeles. Our knitters andcrocheters continue to come to both of our locations. 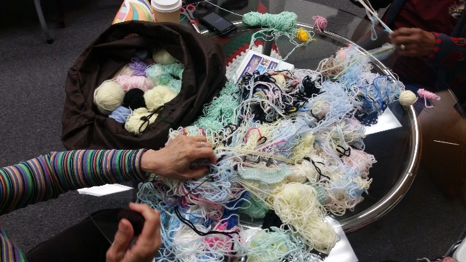 The new monthly knitting group at the CNIB location is slowly growing, and like any new program, takes a while to gain traction. And the 2 weekly knitting groups at our Steeles CRC continue to knit/crochet, chat, laugh and teach each other new tricks they have learned. It’s amazing to watch and listen to the conversations that go on, often dependent on the current news of the day. Certainly, the legalization of weed was a hot topic! 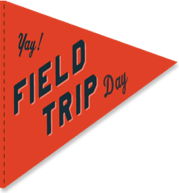 Learn about the wonderful programs, classes and health services they provide and experience a mini-mindfulness lesson as part of the visit. RSVP is required. 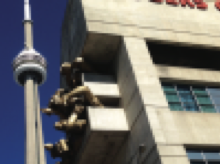 Located near Yonge/Eglinton, it is easily accessible via public transit. Paid parking is nearby. Special Presentation: Rick Ross's "Engineering Toronto's Past - Beyond the Nuts and Bolts"
Join us as Rick Ross, a retired professional Engineer, speaks about Canada’s little-known accomplishments in the world of Engineering. So much of Toronto’s heritage are examples of these accomplishments. Every year, Mosaic organizes a Remembrance Day Ceremony at the Shops on Steeles and 404. We appreciate that the mall management is so open to us using the Centre Court area of the mall where they help set up the stage and chairs. Without their help, we would not be able to do this. Please join us and several guests from the Canadian Armed Forces for this most important event. Not able to get down on the floor to do a yoga pose? Or, maybe you can get down, but can’t get back up? No worries! We will be hosting an exercise program for all abilities. Love gardening? Flowers? Or maybe you appreciate the art of floral arranging. There is no question that the creative minds at Allan Gardens Conservatory put on a beautiful display year after year. If you’ve never been before, this is the year to come!